June is almost over, which means that I need to start acting on my June Challenge. My challenge to myself was to photo what I'm wearing, rate the items and outfits (I did this very informally), purge what doesn't work and make capsules from what does. I've decided that my analysis and ideas should be focused on summer dressing, since we're just beginning the hot parts of summer and that will be the most useful to me in the next couple of months. Dressing for summer is especially casual for me. I'm inside and outside, and need to play with the kids and sometimes climb trees or scaffolding (to pick fruit). I generally dress for the heat, because we rarely run our air conditioner. Sometimes I need to dress smart casually (and those situations generally have A/C), and sometimes the weather is milder. I'll address those needs in separate posts, because it'll get long enough as is. #1: This gingham shirt only works tucked, but sleeves rolled, it's reasonably cool. #1: These shorts are my go-to summer denim shorts now. #2: This splotch shirt is easy breezy, and just a bit more interesting than basic. The culottes in this pic are purged. #3: This dress is a little short for my comfort level, but it fits well and is also easy breezy. I have two others about this length that I haven't yet worn because they feel short. I'm currently thinking that with a pair of cotton shorts for underneath, this can stay, and the others can be judged based on other merits than length. #4: This print top is a little heavy for summer, but with sleeves rolled, I like it. Same shorts as in #1. #5: Lime shorts, black tee shirt. Basics, but they both work for me. #6: olive shirt (still trying to decide if this is a good color for me? ), black and white striped skirt. Both work for me and stay, though the skirt may be more "mild" than "hot" weather, and really isn't appropriate for some outdoor summer activities (like climbing trees to pick fruit). #7: chambray shirt (it's rumpled in the pic) - also cool for summer. There's the shorts from #1 again. #8: gray pixel-print tee. This is out of my normal style a bit with the drapeyness, but I've worn it twice this week, and I like how it works, at least with pants. I haven't tried it with shorts yet. I have other outfits and items in the "acceptable" range, and several that are "mild weather" favorites. I also still have several (4-5) tops and two dresses that I haven't worn to decide whether to keep or toss for this summer. maybe another top or two? I have a few not-favorite-status shirts that are staying around to potentially get added in to the mix too, and the mentioned unworn items to try out yet. I'm planning on four capsules for summer: hot-casual, mild, smart-casual, and wedding guest. This post covers my hot-casual, and except for the olive top with the apple shorts (which now I want to try just to see), I think that everything can be mixed and matched. 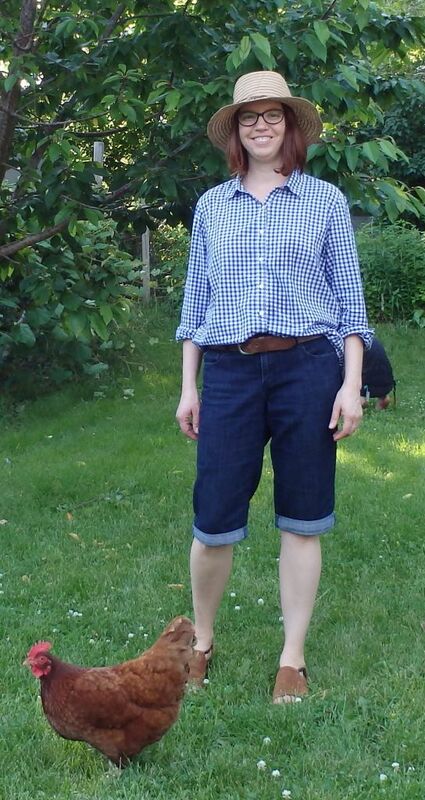 Obviously I have a summer FFBO formula: breezy buttondown with rolled sleeves over long shorts. I think I'm happy with that. What do you see that I'm missing? Any of these items that really shouldn't be invited to stay? Love you in #1 with your pet... and the green grass. (Envy over the green.) I also like #3 and #6. They all look nice. But I do think the top in 4 doesn't look exactly breezy although if you're not getting hot flashes in it I guess it's ok. Ha ha I'm sure you're not old enough for the body furnace yet. I think they're all good casual looks. The last look is my favourite, though I do imagine pants might not be ideal in very warm weather. I don't think the dress is too short but it may not be the right thing to climb trees! You can keep its breezy look intact by simply adding calf length leggings/tights in a light colour and have it work as a summer tunic. And what do you think about white dress like here? is that a summer trend? Your wardrobe is really organised these days, Amiable. Your four summer capsules make perfect sense for your climate and lifestyle. I think your FFBO formula is perfect - easy, breezy and good for tree-climbing. My favourites here are 1, 2, 4, 5 and 7. Congratulations on a very successful June. You look fabulous. My favorites were numbers 1, 3, 4, and 6. You wear those denim jeans really well. I agree with what summer said, including the favorites. Knowing our Heartland summer heat, I would want some cooler pieces for those days, weeks, over 100F, but your outfits are better for protection when climbing trees, etc. I need sleeveless, even with aging arms, to be cool. But then as CocoLion mentions, hot flashes figure into that. You have carefully thought out your needs for summer. I'm looking forward to more of your conclusions. Amy, you look amazing! I am so impressed with your thought process and with your style as it is emerging in these photos: practical, easy, and casual, yes, but it also feels as if you are perhaps veering a bit more towards polish -- and I think it is working for you really well! Your hair and specs add to that impression, of course. I like every one of these outfits. My favourites are 1, 3, 6, and the last one, although that one doesn't look too cool with the trousers. I also really like the dress and think it's a great at home piece if you are not climbing trees. But under shorts are a good idea, too. CocoLion - you're right that the top in #4 is less breezy than the others, and is really more suited to a moderate day than true heat. I almost always run cold, and when I pair it with shorts and sandals, it can take me comfortably into the 90s, but probably not over 100. Maneera - you're right that the pants in the last look were worn on a more moderate day, not really hot (the high was 87). And thanks for the suggestion on the leggings or tights. Last summer, I thought anything tight was just too hot for the heat - but I might revisit that idea this year, or perhaps find something more breathable. Joy - you're also right, I'll need some cooler pieces once the heat turns up a bit. I'll be trying out a few of those items in the next week or so, and, I hope, adding just enough to my wardrobe to plug holes and make it through the summer. And Suz - thank you! It's my hope to add a bit of polish to my style, but in a way that doesn't negate it being easy and relaxed (and casual and practical). I love the "splotchy" shirt in #2, with its casual, tie-dye vibe. Looks so summery in blue. The dress is really cute too and doesn't look too short to me, although I understand it's a comfort thing. I'm looking to add a pair of bike shorts to wear under a new dress that's a tad shorter than I'd like. Capri length leggings was a good suggestion too!